Last week, I started a series of reviews that will show the five main puzzles from the Russian game company Roscreative. 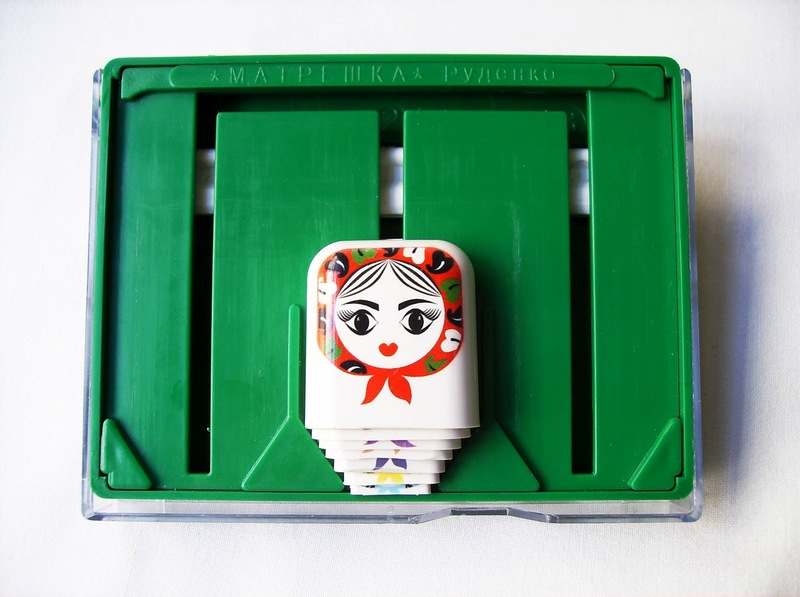 The first review was for the Rudenko Disc and this week, I will review the Rudenko Matryoshka. 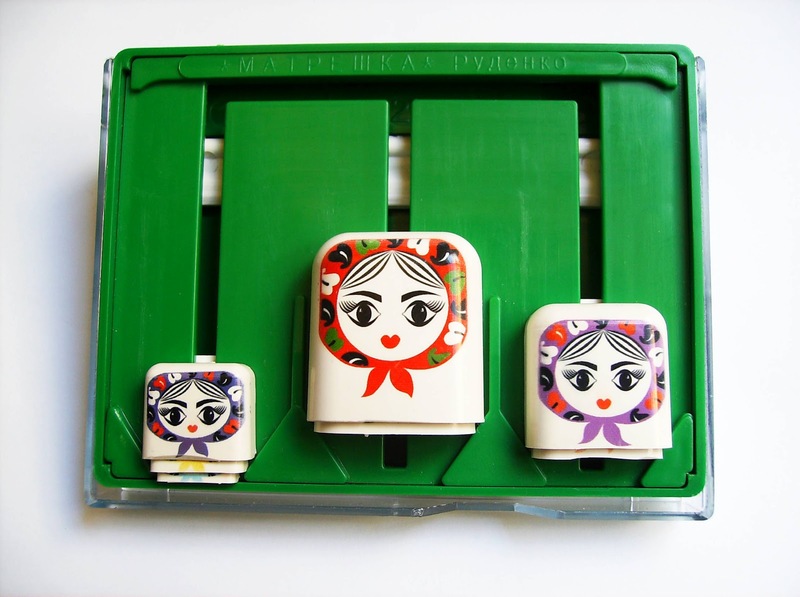 As many of you should know, the Matryoshka is a symbol of Russian culture, first carved in 1890. This interesting concept of nesting a set of dolls with decreasing sizes, one inside the other, is very well implemented on this design by Valery Rudenko (English). 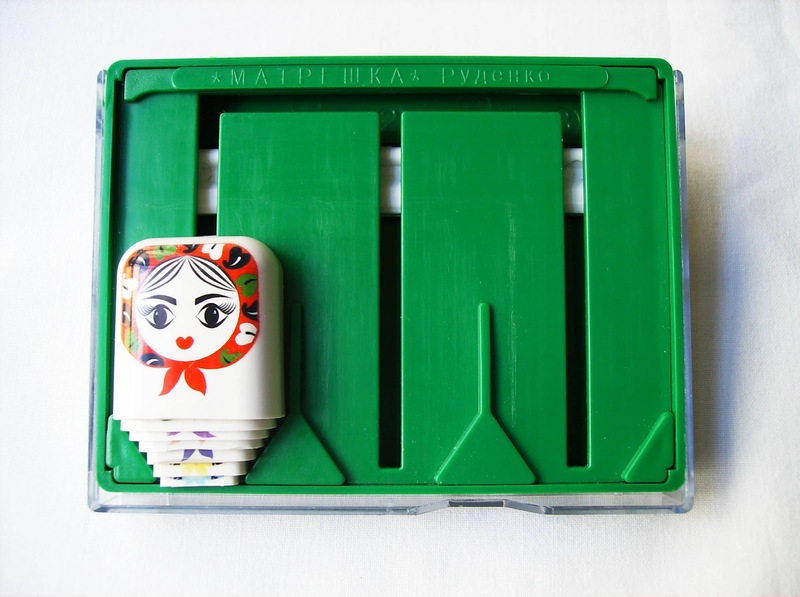 Just like all the other Roscreative puzzles, the Rudenko Matryoshka comes in a blister packaging and the puzzle itself measures 11 x 9cm (4.3" x 3.5"). It has a protective transparent cover that can be slid, becoming a support for the puzzle. 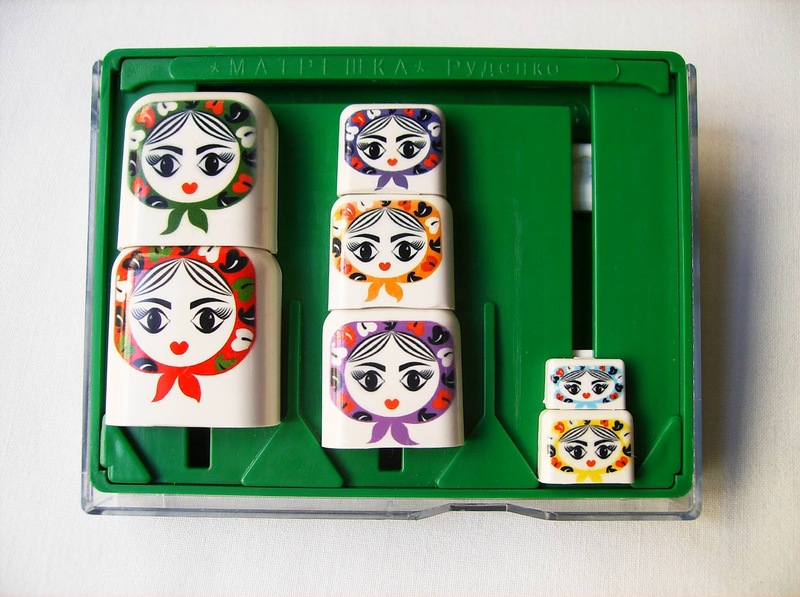 Related to the Tower of Hanoi concept, the Rudenko Matryoshka, a Sequential Movement puzzle (gray code), consists of a set of seven Matryoshka dolls and has three sectors. 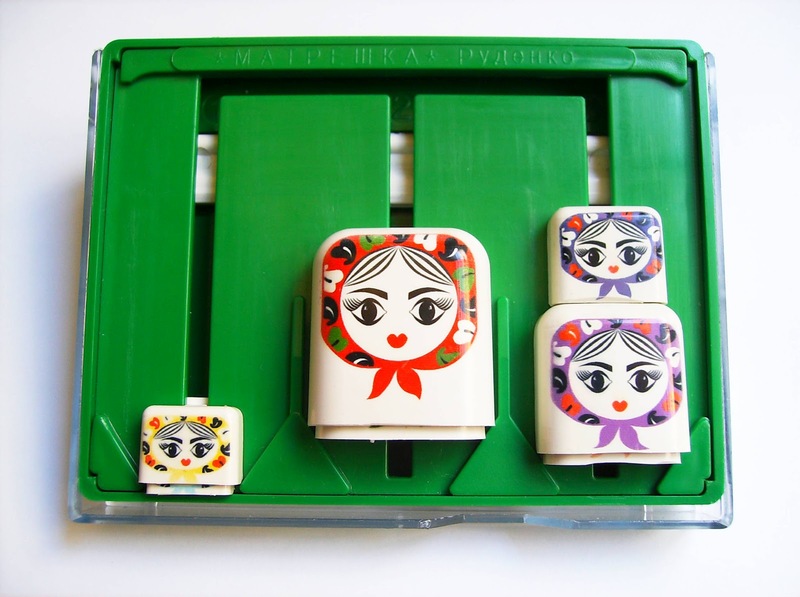 A nice subtle design feature is that each of the seven dolls is painted with a different colored head kerchief. 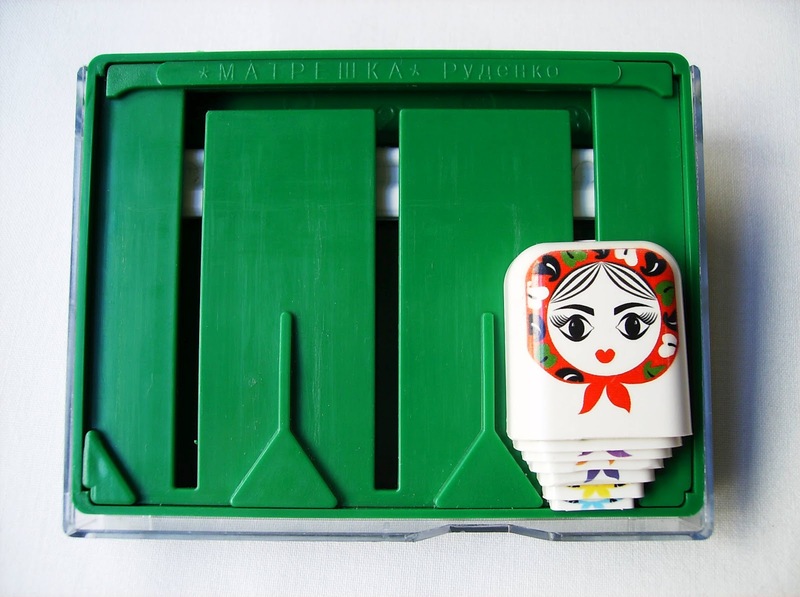 The instructions of the puzzle have a nice analogy of the puzzle in relation to the Matryoshka: The sectors, or rooms are connected by paths and the family of Matryoshkas that live in one of these rooms has to be moved to another room, while following a couple of rules: You can only move one Matryoshka at a time; You may place a bigger Matryoshka over a smaller one, however, you can't do the other way around, which is to have a smaller doll on top of a bigger one. If you're not that familiar with this type of puzzles, there's actually 5 levels of difficulty. 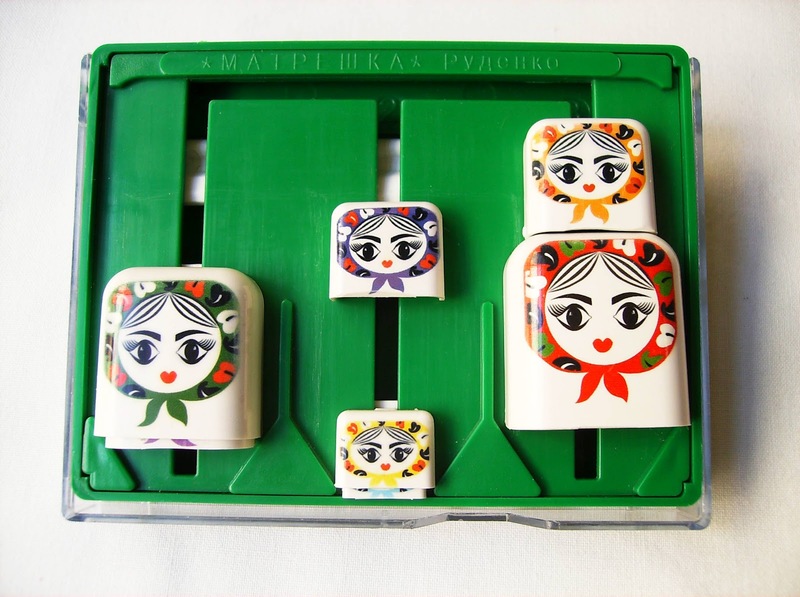 This way, you can practice first with just three dolls, increasing then one by one until you have reached all seven Matryoshkas. Side note: Curiously enough, the Tower of Hanoi had the complete opposite rule for the discs - You were only allowed to place a smaller disc on top of a bigger one. Compared to the Rudenko Disc, I think the Matryoshka puzzle is a bit easier and simpler, because it doesn't restrain that much your movements. Nevertheless, it does have a clever mechanism that prevents certain types of movements. As you can see from a photograph below, I show a type of movement not allowed by this mechanism: When you move any doll from one sector to another, they pass through an horizontal white bar that will stay upwards until you make the doll pass again and place it on the other sector. Only then, the bar will go downwards and allow the next doll to pass. This also signals an illegal move. This is a type of puzzle that with practice develops your algorithmic way of thinking. At first, it may take you some time to get familiarized with the solving process, but as you repeatedly solve it again and again, you'll understand better the movements. A nice way to verify your progress is to count, each time, all the steps it took you to solve it. If the number of steps decreases with time, it's a sign you're getting better at it. For reference, the minimum number of movements necessary to solve the puzzle is 127 - exactly the same as the Rudenko Disc. I have explained this in the previous review with this formula: 2n-1, where n is the number of dolls. This way, you get 27-1=127. Video: Youtube video made by Roscreative. The Matryoshka theme is a perfect fit for this sequential movement concept. With a great modern design and true to his country's symbols, Valery Rudenko has made, in my opinion, one of the best Tower of Hanoi implementations I've had the pleasure to play with. 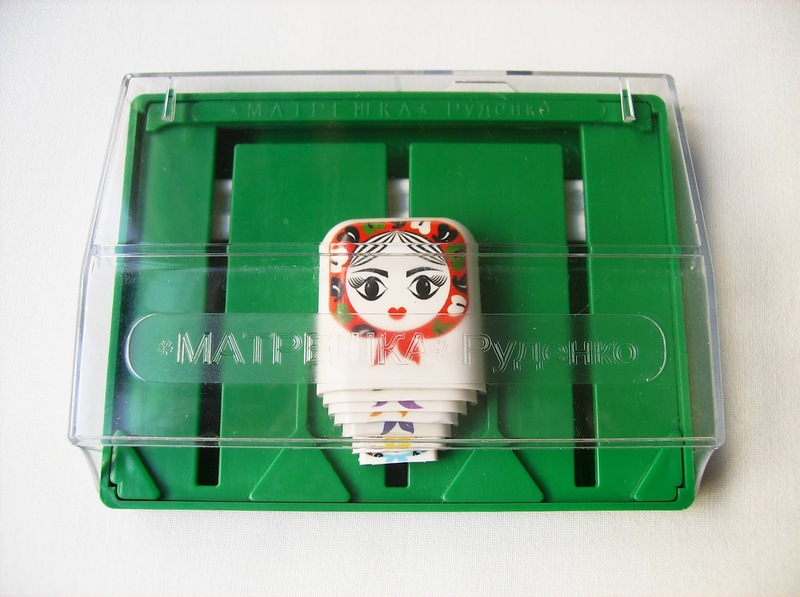 Even if you own a Tower of Hanoi puzzle, the Rudenko Matryoshka is definitely worth a try. Indeed. There are also quite a few other Rudenko puzzles, all very interesting.